AllThingsDigitalMarketing Blog: Sixteen years ago today our country was attacked, crumbling NYC's World Trade Center. Sixteen years ago today our country was attacked, crumbling NYC's World Trade Center. I turned this controversial photo upside-down in 2011 to celebrate the 10th year and today marks 15 years of resilience; Also a symbol of rising peace. Flagship 1 WTC stands at the symbolic height of 1776, the year when we Americans declared our independence and "all men created equal," now once again, 1776 beautifying NYC's skyline. This photo is symbolic for our rising towers, faith and independence. I share this post (update it a bit) every anniversary year. For those born on 9/11 or near that date, please visit birthdaySpirit.org ~~ no matter what your age, visit birthdaySpirit.org and celebrate all goodness born on this tragic day of mourning. You can even register to stay up to date on happenings and things about 9/11 birthday members. Emotionally charged, mixed feelings - 2001 to 2015. From Poet Laureate, Billy Collins' prose commemorating all of the 9/11 victims, "The Names," posted below, to one of the most provocative, unforgettable images by Associated Press photographer Richard Drew, of a man falling from the twin towers, positioned perfectly in the middle. 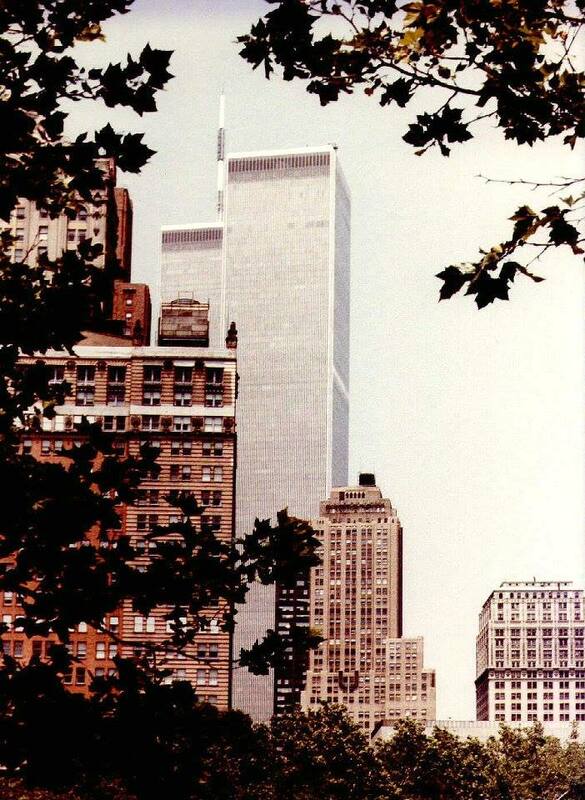 The photo was taken at about 9:41 am on 9/11/01 -- 15 minutes before the 1st building, the South tower, collapsed. Videos would show that the falling man was actually a tumbling man in the air and this is one moment in his time that was captured. 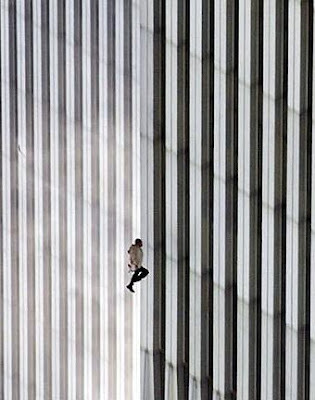 Note how perfectly straight, positioned in the middle and parallel to the burning towers the falling man is. The above photo was branded distasteful and voyeuristic -- never to be shown again, yet the incredible "falling man" is still around. There is much up side today. By the 11th anniversary (2012) the new multi-billion-dollar World Trade Center, was back up in lower Manhattan's skyline. One World Trade Center (formerly known as the Freedom Tower) which was completed on August 30, 2012 and the final component spire installed on May 10, 2013. Budgeted at 3.9 billion upon completion, flagship, One World Trade Center, formerly known as the Freedom Tower, has been opened since November 3, 2014. At 104 stories (1368 feet high), the decorative architectural spire atop makes the building stand at the symbolic height of 1,776 feet. Observation decks will adorn the 100th, 101st and 102nd floors. Tenants so far include magazine publisher Conde Nast and the federal government's General Services Administration. 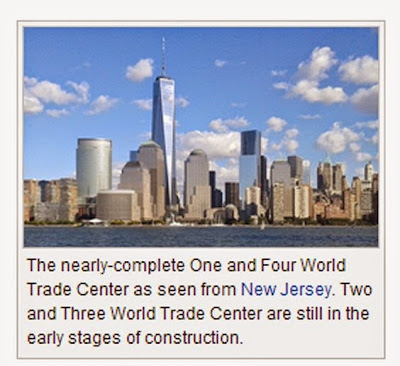 Visit time lapse of 1 WTC video animation of rebuilding 1 WTC. Rendering of 1 WTC photo left courtesy of Wikimedia. 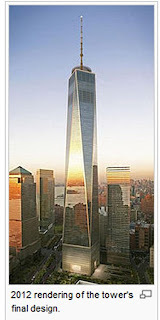 At 72 stories (977ft high) Four World Trade Center, was the first office building to open, (October 2013). First tenants were Port Authority, the Bistate agency that owns the trade center site and lost its headquarters when the twin towers were attacked. According to many articles and documentaries, there were about 200 people who jumped to their deaths, some were able to be identified only for the victim’s families and to provide closure for them. But there was no time to recover or identify those who were forced to jump prior to the collapse of the towers. We lost almost 3,000 lives that day. I was working on Wall Street( on the corner of Wall and Water Streets). It was a beautiful, clear skied morning. I arrived early as I usually do and was at my desk on the computer when I heard a loud bang and felt rumbling underneath my desk at 8:46 a.m. I shouted "What was that?" Then 15 minutes later another bang, as some fellow employees arrived - initially we thought it was from a missile. Hard to imagine it would be the biggest single attack on American lives. I still keep asking myself "how could this be?" I was curious and ran outside to see what was happening. As I was walking on Water St. and reached Liberty St., it was at about 10:00 am, I saw large billows of gray smoke, appearing to turn day to night, enveloping hundreds if not thousands of people running for their lives – apparently heading towards the river. I asked some folks what is happening and all were in shock. With all the commotion, all they could say while they were running was “it’s down, it’s down.” At that moment, I thought another plane came down. I ran back to the office and learned from colleagues that the South tower collapsed (incidentally, this was the 2nd building hit). The North tower (1st building hit) collapsed at about 30 minutes later. And the world would never be the same. http://www.youtube.com/watch?v=8EFvGuIXIJc&feature=related Images of bodies hanging out of windows, holding on across the steel across windows, leaning out for air.